Members of UNICEF-OSU gathered to dance the night away March 23 for their annual fundraising gala, “A Starry Night,” aimed to raise awareness and money for people affected by civil war in Yemen. The annual gala raised money for UNICEF, which aims to eradicate childhood illness, poverty and hunger in 190 countries around the globe. Proceeds from the gala will go directly to the humanitarian efforts in Yemen. 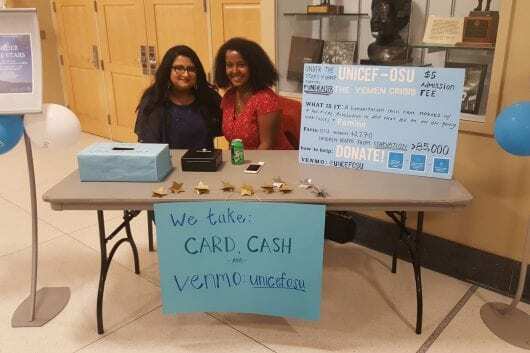 The money raised from the event and other fundraising efforts will be matched by The George Harrison Fund for UNICEF, said Helina Solomon, a fourth-year in world politics and co-president of UNICEF-OSU. Last year, Solomon said UNICEF-OSU raised $4,800 with a final amount of $9,600 donated with a matched donation from the fund. The gala included a performance from Dancesport — a Columbus dance center — and a traditional Palestinian dance from the Arab Student Union, which followed speeches from leaders with statistics that informed gala attendees about the cause they were supporting and the impact of their donation. According to the BBC, the Yemen civil war started when the government opposition Houthi movement annexed a northern portion of the country in 2014 while leadership was unstable under new president Abdrabbuh Mansour Hadi. Nine western-backed, largely Sunni Muslim countries started air strikes against the Houthi movement in March 2015 with hopes of restoring government control to President Hadi. The country has experienced civil war ever since. As a result of the years-long conflict, 22 million, or 75 percent of the population, need humanitarian support, according to the United Nations. As of January 2019, more than 360,000 children under the age of 5 are suffering acute malnutrition, according to UNICEF. The funds raised Saturday will go toward providing safe drinking water, vaccines and learning supplies for children who have had their childhood disrupted by the conflict. Yemen might be the largest current humanitarian crisis, but Soloman said he does not think it is getting an adequate amount of media coverage and hopes the dance brings awareness to the issue across campus. Thanks so much for coming to talk to us Deborah. Small correction- That amount was from the first year of masquerade ball, not this last year!